Love and gay marriage | Enjoy your online practice! Article: #Lovewins - Why Was Love Fighting In The First Place? On Friday, June 26, 2015, the Supreme Court in the US legalised gay marriage in all 50 states. Social media erupted, and I began to participate with the simple act of placing the rainbow filter over my profile picture. At first, it felt trivial. It seemed a small and somewhat meaningless gesture in comparison to what I was witnessing online over the days to follow the ruling. With tears filling the corners of my eyes, I thought, quietly, of all the struggles the LGBT community has had to endure, the courage and strength it must have taken all of these years to feel marginalised and still stand tall. I began to question humanity, our notions of equality, and how we have arrived where we are. When it comes to love, in it's true essence. . .is there any right and wrong? How can there be? It felt a bit insane that we, somehow, somewhere along the way, declared notions about love to begin with. 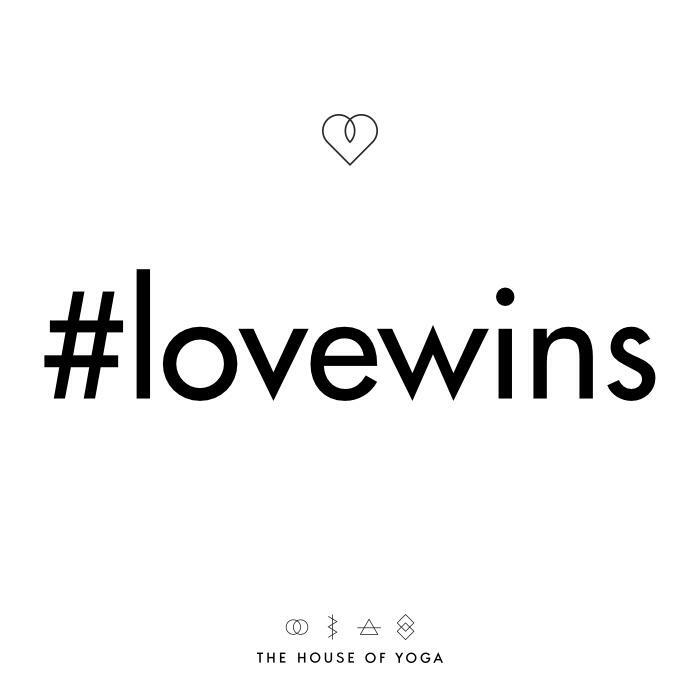 The hashtag, attached to the Supreme Court decision, that went viral was #lovewins. And I wondered how (and why!?!) we had engaged love in any kind of battle. Love should never have had to fight. When I watched this video (which has now spread rapidly on YouTube), it filled the ideas which were awkwardly tumbling between my head and heart with real humans, real stories, and real tears. And while this ruling is a triumph for us all, it is also a reminder of our shadow—how quickly we can fall into the trap of discrimination, righteousness, and playing ‘God’. Suddenly, a slideshow began to play in my mind of all the ways we have declared the ‘other’ as evil or wrong or bad, without realising what we are doing and feeding in the process. And when this collective shadow breaks for a moment, as it did last Friday, there is great relief and celebration. . .but I cannot help but wonder about our future. Will we call love to battle in other ways? What is the next #lovewins scenario? As a student of depth psychology, I cannot ignore the shadow lurking behind the light. It is only by bringing light to the darkness of our own being that we can begin to reconcile with these parts of our collective psyche. When we repress the shadow (the parts of us we don’t want to be or acknowledge) into the depths of the unconscious, it will often erupt in devastating ways. And while we can see this notion of “bringing together again” existing between opposing groups or individuals in society, we can also begin to explore this concept in regards to our own psyche—“bringing together again” the contents of our unconscious with the light of our own consciousness. That is where our true work lies.In fact, often, we cannot reconcile with the ‘other’ in outer form, until we have reconciled with the ‘other’ inside of us. It is not always easy, but we begin to regain a sense of who is present within us and invite them all into the light of our awareness. Only then do we set the conditions for true transformation to occur. It is all a bit bizarre. We have set up the very situations we are fighting against. Equality should not be a goal we attain, but the very basis of our beginning. I felt a swelling begin to rise in my heart. I found the nearest keyboard and offered a flower upon the altar of the LGBT community (and all of those who have experienced discrimination in any way) in the form of a poetic reflection that seemed to flow through me and out in the form of words. Words, which at the end of the day, seem humble and small, and yet I can think of nothing more pure to offer. I have planted a flower of love within you. and your roots grow in the same soil. When one prevails, triumph is for all. When one grows, all transcend. Don’t keep each other small. Your growth depends upon one another. or bow your head and let me in. It is the starting point.